It’s the second anniversary of The Ordinary!! Huzzah huzzah!! Flips and possets and toddies for all my friends! It’s a dark, pouring-down-rain day, and I sit here contemplating The Ordinary and the world at large. Everything feels a little chaotic and out of control, with government shutdowns and debt ceilings and changing climates and wars and near-wars everywhere you look. I’m still reading Zola’s Germinal (I know, I know, I’m slow). Striking miners are banding together, thousands of them, frantic and desperate after months of hunger and deprivation, they’re storming across the countryside, they’re destroying machinery. They’re shouting, “Bread, bread, we want bread!” They don’t want much: they want a home of their own to keep clean and warm; they want enough food to eat; they want some special days of celebration, with fancier meals and more beer; they want to be paid a fair amount for the work that they do; they want some sense of safety and security. They’re not shutting everything down to keep people from something essential, something they need, like access to a doctor when they’re sick. (Oh, how I’d love to have health insurance!) They’re not acting out of pettiness and spite to hurt people who don’t have much, they’re acting out of need, to ask for just enough. It’s a very Ordinary theme. We’d like to write demands for a new Bon Vivantery. Rules whereby every person can live well; not extravagantly, not lazily, but assured of enough. Assured of a chance to be healthy, a chance to know what’s really happening in the world around them and farther afield, a chance to work at what they love, a chance to have food and ideas and energy and materials to create something good every day, and to work towards something better as each day goes by, a chance to feel really alive, to glow amidst the pouring-down-rain and deluge of confusion and nonsense all around us. Isaac named this sunshine pink soup. And he really loved it! He ate several helpings. In reality, it’s all of the vegetables left from the farm at the end of the week, roasted together and pureed till smooth. 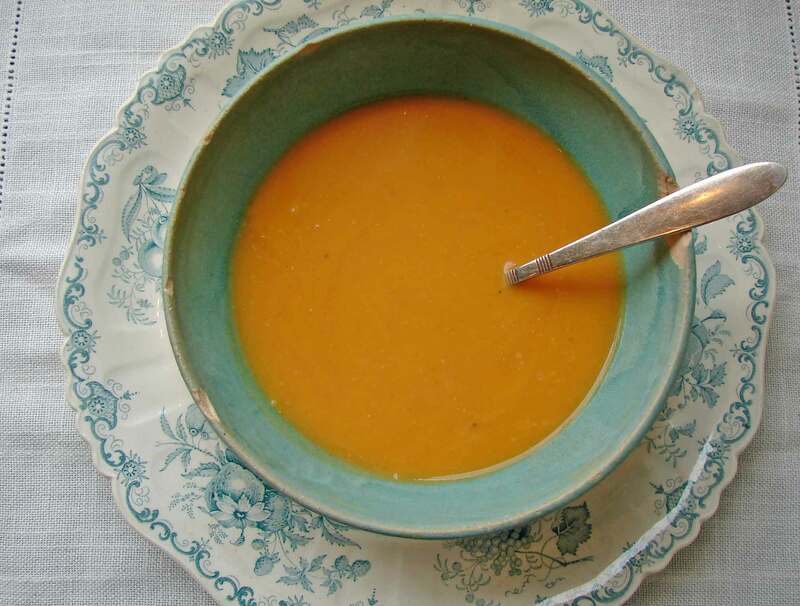 The vegetables were very autumnal, winter squash, sweet potatoes and beets, so the soup has a sweet, warm flavor and color. I added ginger, rosemary and lime, for some contrasting bite and zing. I made some nice soft rolls to go with it, and that was that!! Here’s Art Blakey’s Moanin, live and full of style, grace, beauty and joy. I’m still feeling a little dazed, dizzy and down from being sick the other day. (Or maybe just from being Claire, but we’ll blame it on the sickness.) Last week I was thinking a lot about discouragement and ambition and the connection between the two – being afraid to try, being cabined, cribbed, confined by saucy doubts and fears. I was thinking about failure and success, about why someone tries, and how they determine whether or not they’re successful. And then I got sick and felt completely empty – like the black holes that Isaac likes to talk about. And then I came back to life and the world seems, honestly, a little overwhelming. Too much information, too much useless chatter, so much strange bad news. I feel very earnestly and passionately confused, which is actually a good feeling, like recovering your appetite, it feels good to care, good to think, good to be in a muddle. And it’s a good excuse for the nonsensical ramble pouring forth before you. I want to clear my head of all the clutter and distraction, I want to fill it with good things, I want to create a … well, a sort of a sourdough starter of thoughts in my head, a little culture of thoughts, and feed the starter with fascinating thoughts that other people have thunk, and let those ferment until they make sense to me, and watch it grow and become wild and full and, ultimately, nourishing, in conjunction with other ingredients that I might pick from anywhere! I want to take this nagging empty, insignificant feeling and fill it up with some sort of light. I spent some time this morning reading Emerson’s essay on self-reliance, and so much of it resonated that I’ll tell you all about it. That’s right, I’m going to quote an essay that’s all about the importance of not quoting other people, of thinking for yourself and forming your own ideas. Emerson says, “A man should learn to detect and watch that gleam of light which flashes across his mind from within,” and I love the idea of this, as it speaks to me in my current mood – the idea that we should learn to ignore the judgments and values of others, their chatter about what is important and what is wise, and even what is good, to listen to the spark of light within ourselves, and to give life and value to that. “If they are honest and do well, presently their neat new pinfold will be too strait and low, will crack, will lean, will rot and vanish, and the immortal light, all young and joyful, million-orbed, million-colored, will beam over the universe as on the first morning.” You won’t worry about your abilities, or compare them to those of others, if you’re focussed honestly on the light within yourself – your own spirit, your own soul. “Nothing can bring you peace but yourself.” When David came home for lunch today, he said his idea of a good vacation would be to be Isaac and Malcolm for a while – to look forward to everything and feel good about your place in the world and about what you think and what you make and what you enjoy. As Emerson said, “The nonchalance of boys who are sure of a dinner, and would disdain as much as a lord to do or say aught to conciliate one, is the healthy attitude of human nature. A boy is in the parlour what the pit is in the playhouse; independent, irresponsible, looking out from his corner on such people and facts as pass by, he tries and sentences them on their merits, in the swift, summary way of boys, as good, bad, interesting, silly, eloquent, troublesome. He cumbers himself never about consequences, about interests: he gives an independent, genuine verdict.” I think its harder than he makes it sound, looking out from your corner and watching people and facts pass by, it’s a lot of work, but they have fun doing it, in their swift and summer-y way. Well, that’s it for now, folks, but you haven’t heard the last of this foolish train of thought! Be forewarned! To quote Emerson one last time…”A foolish consistency is the hobgoblin of little minds.” Of course, Emerson was speaking of the foolish consistency of starting each and every meal with olive oil, shallots and garlic. Last night I made this soup, and I didn’t want it to taste like every other soup I have ever made, so I decided to leave our shallots and garlic altogether! Shocking, I know! I had some very great fears that it wouldn’t be flavorful. But it was extremely deliciously flavorful, and bright and comforting. Lovely and balanced and creamy. I used a larger ratio of carrots to parsnips and apples, but you could easily adjust that to your taste and to the contents of your larder, if you have such a thing! Here’s Bob Marley with Wake up and Live. If ever a man ignored the wolf pack and let his own light shine, it was this man. Happy birthday, Bob! Don’t bury your thoughts; put your dream to reality, yeah! Well! Thank god all of that Thanksgiving nonsense is over, and now we can get on with our lives, and go back to being ungrateful acquisitive bastards. Now here’s my christmas list. See that you get exactly what I specify!! I’m kidding, of course. But I was thinking about the phrase “thank you,” and how, when it seems spontaneous and sincere, it’s as welcome and unexpected as sunshine on a winter’s day. I have a friend with four children, and her three-year-old doesn’t talk much. But he’ll say “thank you” at the most surprising times, when she does some little thing for him. And when she told us about this, she put her hand to her heart as if the fact that he says “thank you” is so sweet it almost hurts. It’s a funny thing, being a mother. You do so much for your little ones, all day every day, and you can teach them to say “thank you” out of politeness. But it’s not likely that these small, incompletely developed people understand why they should feel grateful for your tireless service. After all, you’ve been catering to them since before they were born. To them it’s just the way life is – it’s how they need and expect it to be. They don’t know how much your life has changed since before their birth – how much you’ve given up for them, and how much you’ve gained. Your life is theirs, in some ways. Their knowledge of you and their sense of your history with them is something that they cling to. And, to be honest, I feel so cranky and anxious half the time that I forget to acknowledge the sweet things they give to me every day. I take for granted their light and warmth. The other day Isaac came and sat behind me on my chair, and rested his head on my shoulder. Did I say “thank you” for this great gift? I did not, I said, in a cranky voice, “what are you doing?” I feel like I’ll always regret that! I was thinking today that we’re all like oblivious children as we move through the world. People ring up our groceries and put them in bags, serve us in restaurants, leave us tips when we serve them in restaurants, help our children to cross the street, pick up our garbage, pump our gas. We might say “thank you” because it’s polite. but when it seems sincere, when somebody really seems to recognize the value of each small job in all of its great weight, that feels like a gift in itself. And then gratitude feeds upon gratitude to form a giant mountain of thankfulness! When I make a meal, David always says thank you. And when they hear him say it, the boys say it, too. And then they say, “but I don’t really like it, can I have pasta and tamari instead?” But they liked this soup, they all liked it! It was a little smokey, a little sweet, a little tart and a little spicy. But overall warm and comforting. Here’s Gratitude by the Beastie Boys. Live! It’s Isaac’s birthday! He was born seven years ago on a golden glowing fall day, just like this one. I felt such a surge of joy and love when he was born, and it hasn’t really abated in these last seven years. My sweet, small, jolly Isaac is getting tall and thin. It’s hard, with the second one, to notice all the changes – he’s always the little one. He’s so excited about his birthday. He was sad that halloween was cancelled, and needed assurance that nobody could cancel his birthday, not even the mayor. 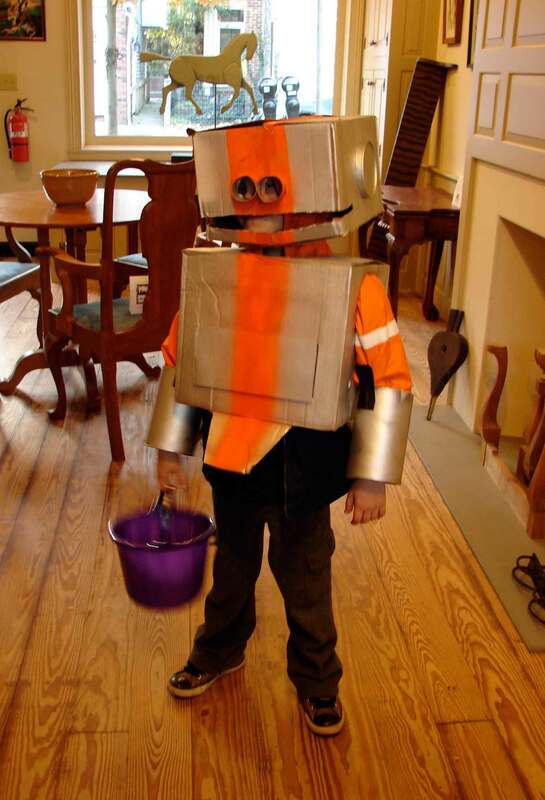 He was a robot for halloween, the cutest robot you’ve ever seen. I walked him to the consolation party at the school, and he looked out of his toilet-paper tube eye-holes at all his friends running around to the dance music. He sat on a metal folding chair against the wall, because it’s actually hard to do the robot, when you are a robot. He sat and waited for the faux trick-or-treeting. I wonder what goes on in his busy mind, at times like this. I want to tell him to run around with his friends, because I worry about him feeling lonely, but I’m glad that he doesn’t need to. He’s always been very self-sufficient and content with his own company. He’ll sit for long periods of time drawing and singing. Inventing worlds and creatures to live in them. He’s compelled to draw, and he’s almost always happy with the results. He sings constantly, about everything going on in his life. He sings his life, with sweet, pretty songs that get stuck in your head. He talks a lot, too. He’s always had a lot to say, and a smart, clear, peculiar way of saying it. He talks faster and louder and in a higher pitch when he’s nervous or angry, until only dogs can hear him. He likes to talk to everybody he meets, telling them things I sometimes wish he wouldn’t. (“Mom, isn’t that the boss you don’t like?” Heh heh, noooo, that’s some other boss…) You can’t really look at Isaac without wanting to snuggle him, and he’s a natural cuddler, he’ll cuddle you right out of bed. He’s a man who has invented an entire vocabulary around cuddling. There’s the circle cuddle, the tent cuddle, the birthday cuddle, the super-fast, intense, concentrated cuddle (actually I invented that one.) He’ll tell you that he loves you and you’re fun to be with, just because he feels it. (For now!) He’s frustratingly vague and flighty. He doesn’t understand the concept of walking in a straight line. He floats and spins and stops and goes. He won’t tell you he wants something till after it’s gone. He’ll walk right by a brand new bike on his birthday, back and forth many times, and you’ll have to tell him that it’s there. (Whereas Malcolm could sense a brand new bike in the house, if it was hidden behind closed doors several floors away.) He’s got pale golden hair, and pale soft skin, and he glows with all of the radiance of his bright cheerful sweetness. I’m going to tell you something shocking. Isaac doesn’t generally like my cooking. It’s true! Hard to believe, I know. It’s tempting to say that Isaac only likes pale foods with butter, but the truth is he loves sharp, spicy strong-flavored food. He loves olives, and capers. And his favorite food is Indian food. Which is why he liked this soup. He refused to taste it, at first, but I gave him a small bite with basmati rice, and he went on to eat a whole bowl. He really liked it!! I was so proud. Everybody liked it, actually. 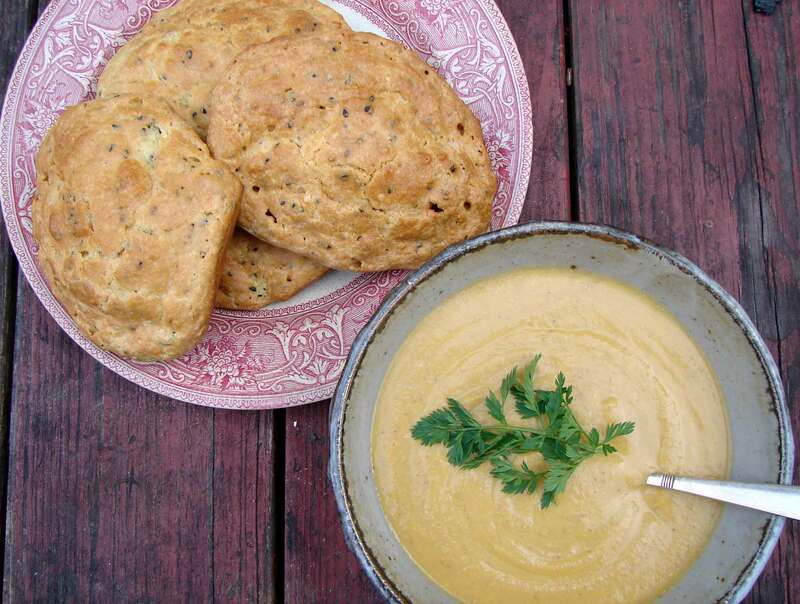 It’s simple and flavorful, and smooth, and nice with the biscuits, which have a bit of texture from the seeds. I used nigella seeds, black sesame seeds and mustard seeds, but use what you have! Here’s Memphis Minnie with I’m Gonna Bake My Biscuits. I’ll let Isaac choose the song when I tell you about his birthday cake! We have ten pounds of sweet potatoes at the moment, from our CSA! And two huge bunches of beautiful carrots. 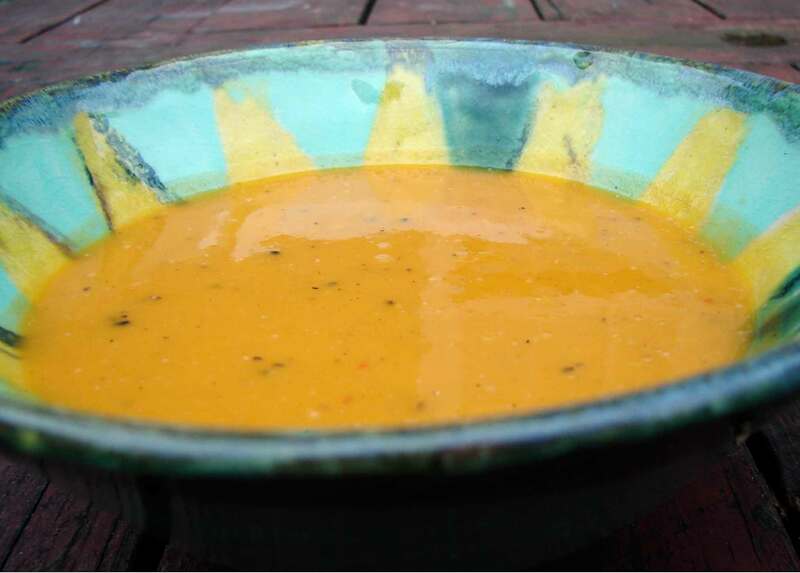 What better way to use them then roasted in this smoky spicy bisque? It’s a very simple soup – just a few ingredients and spices. So it’s quite light, though satisfying. The warm sweet flavor of the vegetables really shines through. Could be a spoonful of diamonds, gold, or sweet potato bisque!! Here’s Etta James with Spoonful. Remember Bob Ross and his happy accidents? 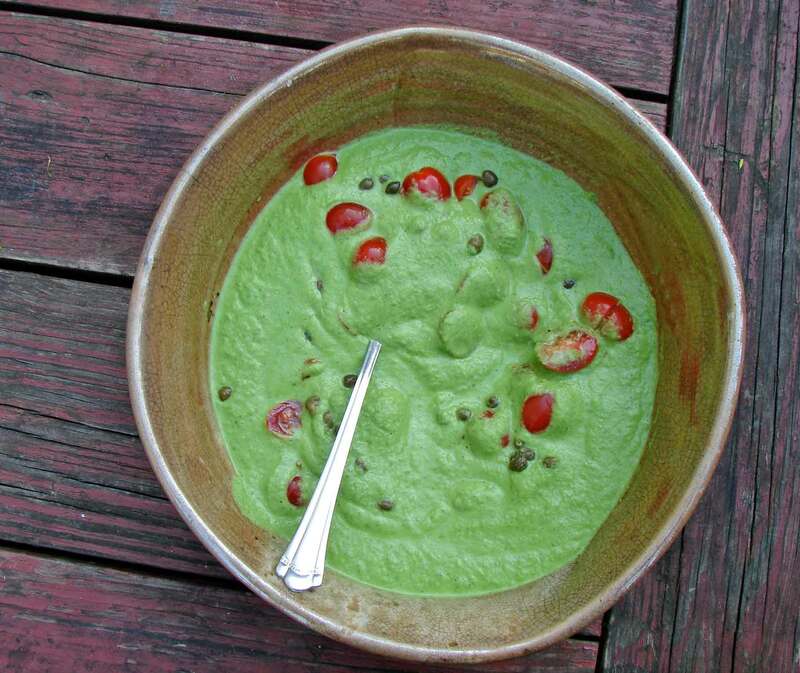 This soup was the result of a happy accident, in some ways. NO I DIDN’T PUT TOO MUCH BURNT SIENNA ON MY FAN BRUSH!! 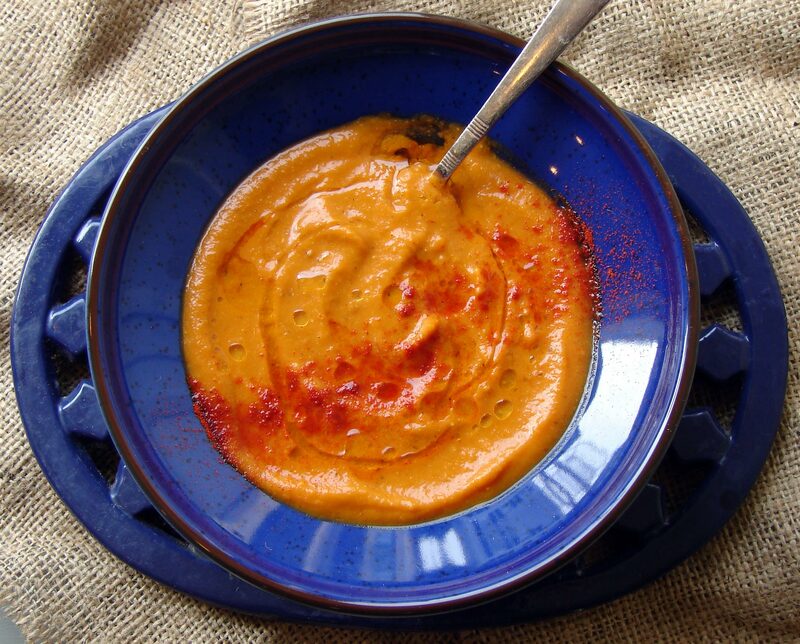 I just made the roasted red pepper-almond sauce too hot and spicy. That’s right, the one we made with our empanadas. 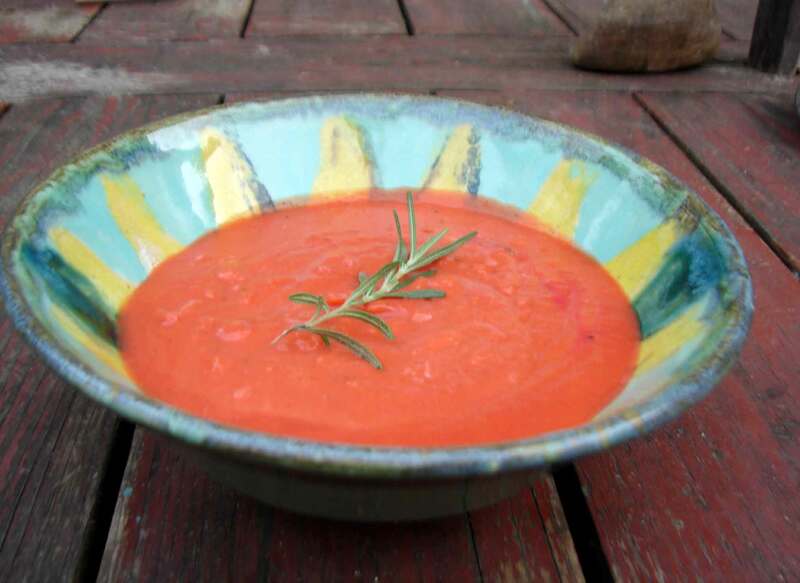 So last night, with fiendish cleverness and calculation, I decided to use the sauce as a base for a soup! Thus spreading the spicy joy around, and rendering it more palatable. I decided to add roasted butternut squash because it’s so mild and sweet that it could easily accommodate a bit of heat. And then I thought about all the roastiness going on, with the pepper, and the chipotle, and the squash, and I thought fire-roasted tomatoes would go well (from a can, unfortunately – it being February). 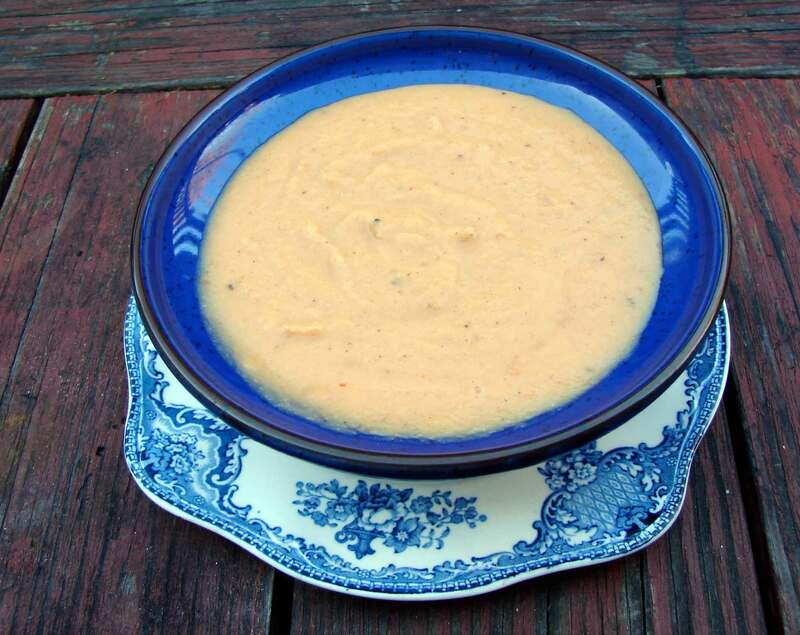 So I made this lovely, velvety, sweet, smoky, spicy bisque. Here’s Lee Perry with Roast Fish and Cornbread, because, let’s face it, I’m never going to have recipe for roast fish, and this song is wonderful!